Enjoy the great outdoors on a camping trip in Branson. From campsites to hiking trails, find out everything you need to know to plan an unforgettable family excursion. Fresh air, a cozy campfire, the sweet taste of s’mores — there’s no better way to enjoy a weekend getaway than camping in Branson. Add to those attributes the beautiful natural surroundings of the Ozarks and you’ve got yourself one awesome outdoor adventure! Of course, there’s more to camping than just pitching a tent and stoking the fire. A great camping trip includes exploring hiking trails, a little fishing and did we already mention s’mores? 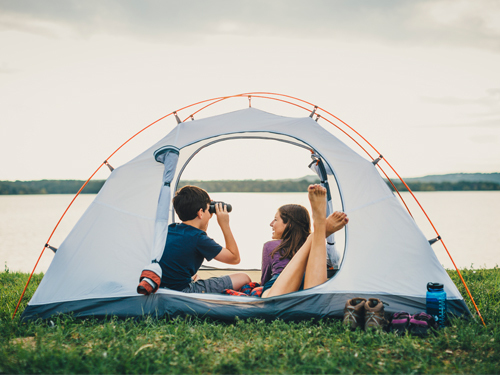 One of Branson’s most popular camping destinations is Table Rock Lake, which features two campgrounds – Viney Creek Recreation Area and Table Rock Lake Campground. Trails around Table Rock State Park give your camping crew a great environment to explore the outdoors. Trails of varying lengths are open to hiking and biking, while the popular Table Rock Lake is one of Missouri’s top fishing destinations. The marina also has plenty of options for boat and equipment rentals and nearly 800 miles of shoreline to enjoy. And if you tire of hot dogs and beans, there are a number of dining options in the area. The Busiek State Forest and Wildlife Area offers another great spot for camping, though sites are limited and must be reserved in advance. Busiek is home to 18 miles of trails; take your bike or your horse, the trails are open for biking and horseback riding. In addition, Busiek is a haven for bird-watchers, as 138 species have been recorded in this area. Spring in Branson, often referred to as “Ozark Mountain Spring,” offers mild temperatures and new life with abundant dogwoods, redbuds, wildflowers, tulips, daffodils and forsythia in bloom. March, April and May are some of the best months to explore Branson’s many hiking trails. Bring a warm sleeping bag and extra warm socks for the evenings after enjoying beautiful temperatures throughout the day exploring the Ozarks. And for the fishing enthusiasts, Branson hosts the Big Bass Tour and Costa FLW Series fishing tournaments every April at Table Rock Lake. Longer days of sunshine make summer ideal for getting the most out of camping in Branson. Take a swim in the lake, rent water sport equipment, spend the day relaxing with a fishing pole – all in warmer, but not unbearable, temperatures. Even when fall is in full swing, cooler temperatures shouldn’t dissuade you from camping in Branson. While you’re en route and after you’ve set up camp, you’ll be wowed by the brilliant colors Mother Nature produces during the fall months in Missouri’s Ozarks. And if there’s a little chill in the air at night, just throw an extra log on the fire and bundle up for a cozy and comfy night’s sleep. If you’re visiting in September, be sure to check out Bass Pro Shops’ Outdoor Days at Table Rock State Park for plenty of outdoor activities and exploration opportunities. With so much beautiful nature to enjoy, camping in Branson is the perfect way to truly relax and take advantage of all the Ozarks have to offer. So, grab your camping gear and get ready for a trip to Branson, where fun beckons outdoor enthusiasts of all ages. 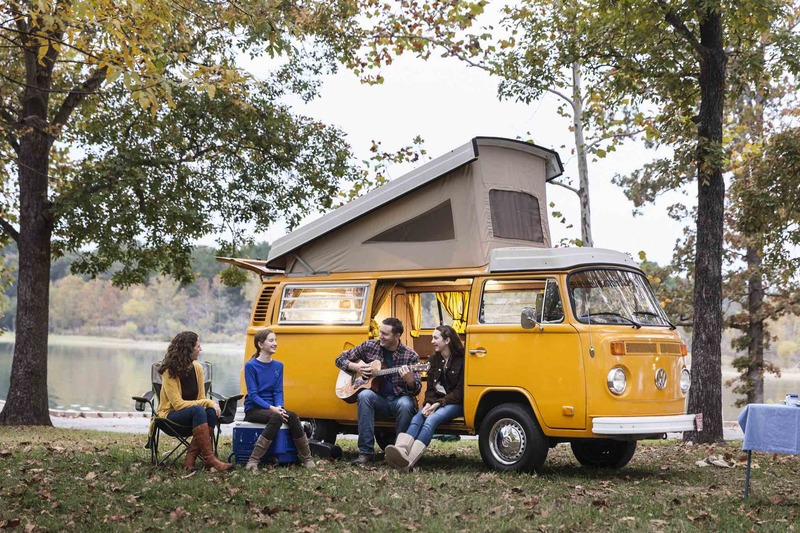 Check out our list of suggested campgrounds to find the right spot for your vacation.